201503150001hq (03/15/2015) — Taking a moment on Mar. 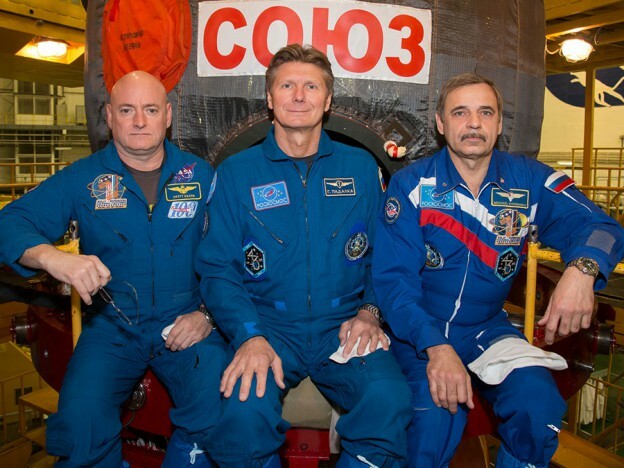 15, 2015 during their Soyuz spacecraft training to pose for a photograph in Kazakhstan is Expedition 43 NASA Astronaut Scott Kelly, left, and Russian Cosmonauts Gennady Padalka, center, and Mikhail Kornienko of the Russian Federal Space Agency (Roscosmos) at the Baikonur Cosmodrome. The International Space Station raised its orbit on Wednesday evening, placing it in the correct orientation for the docking of a new Soyuz spacecraft and crew next week. Inside the station the multinational Expedition 43 crew stayed focused on long-term microgravity studies and the upkeep of their orbital laboratory. The ISS Progress 58 spacecraft, docked at the aft end of the Zvezda service module, fired its engines Wednesday afternoon for four minutes, 18 seconds. The orbital boost readies the station for the arrival next Friday of the Soyuz TMA-16M, which will carry to the station Soyuz Commander Gennady Padalka and One-Year crew members Scott Kelly and Mikhail Kornienko. Meanwhile, Commander Terry Virts put on his high-flying plumber’s cap and replaced hardware on the Waste and Hygiene Compartment. He also participated in the Astro Palate study investigating how food affects the mood of crew members during a spaceflight. After troubleshooting the BioLab earlier in week, Italian astronaut Samantha Cristoforetti began the first of two runs of the TripleLux-B experiment inside the BioLab glovebox. TripleLux-B studies cellular mechanisms that cause impairment of immune functions in microgravity.